This is for all the vegetarians and vegans I've been hearing from. (But the rest of you will love these ideas, too.) 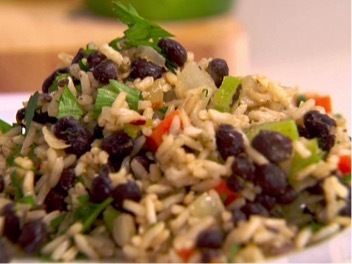 We eat a LOT of rice and beans and we can never have too many ideas on how to jazz up these versatile basics. 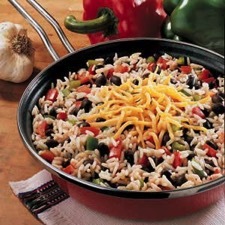 I've found that with rice and beans, it's hard to flub up and really pretty easy to go from ho-hum to HOLY COW! 6. Sauteed garlic, mushrooms, peppers, onions, etc. 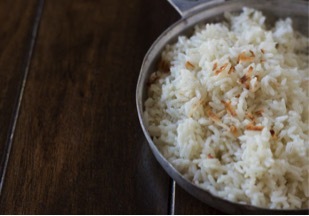 Coconut Rice: 1 1/2 cups of water, 1/2 cup of coconut milk, 2 tbs chopped and shredded coconut, 2 tsp honey, 1/2 tsp salt, and a pinch of allspice. 2. Curried Rice: 2 cups of chicken broth, 1 tsp curry powder, and 3 tbsp of dried currants. 3. Ginger-Soy Rice: 2 cups of water, 2 tsp soy sauce, 2 tsp grated fresh ginger, and 2 whole cloves. 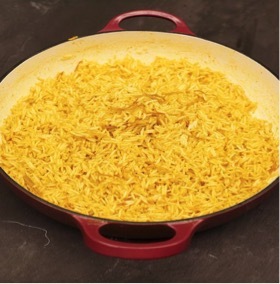 Lemon Rice: 2 cups water, 1/2 tsp salt, 2 strips lemon zest, and a pinch of nutmeg. 5. Saffron Rice: 2 cups of vegetable broth and a pinch of saffron. Finally, as I was thumbing through Aunt Annie's recipe box, I found several recipes for Classic Frugal (yet tasty) Rice Dishes. This amazing cook knew how to stretch a nickel and make the buffalo moo, and I used these recipes over and over when our seven children were home. Black Beans and Rice : The budget-stretching standard. This one-dish meal starts in a skillet and calls for onions, bell peppers, oregano, a little vinegar, etc. You probably have a recipe you favor. What jazzes it up though, is lots of fresh chopped cilantro folded in just before serving. 2. Easy Rice Pudding: This basic recipe just needs sugar, eggs, milk, vanilla, raisins, and cinnamon. Be sure to use freshly grated cinnamon (Ceylon if you can). And then a smidge of freshly grated nutmeg sends it over the top, flavor-wise. 3. Rice Pilaf: Start with butter, onion, chicken broth, and parsley. Then add in whatever you have on hand. We call ours "Kitchen Sink Pilaf" (because everything's in there but the kitchen sink). 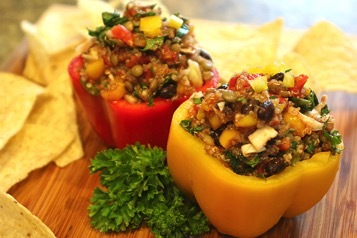 Southwestern Stuffed Bell Peppers : In this recipe, I combine pre-cooked rice with all sorts of lightly steamed veggies (broccoli, cauliflower, leeks, chopped kale and chard, summer squash, and carrot), black beans, taco seasoning, canned diced tomatoes, jar salsa, and shredded cheddar cheese (for my hubbie's benefit). I stuff bell peppers and bake them sitting in a pool of tomato sauce, for about 45 minutes. 5. Cheesy Broccoli and Rice with Cannellini Beans: Apart from the obvious, you'll just need cream of mushroom soup, milk, salt, a little powdered garlic, and pepper to create this filling dish.